Diabetes is one of the most dreaded diseases in the world today. It has caused insurmountable amounts of pain and suffering to numerous patients all over the globe. Year after year, the number of sufferers increases continuously, mainly because of the lack of proper information regarding its possible signs, diagnosis and treatments. It is very important to fight off even the early signs of this disease in order to prevent further complications like nerve damage, blindness and chronic renal failure. Diabetes has numerous signs and symptoms, most of which are very difficult conditions that cause people insurmountable amounts of suffering, pain and discomfort. Amongst the many symptoms, polydipsia and polyuria are amongst the most common. These medical conditions cause increased intake of fluids, elevated levels of thirst as well as frequent urination. Major signs of type-1 diabetes are irreducible mental fatigue and significant loss of weight. 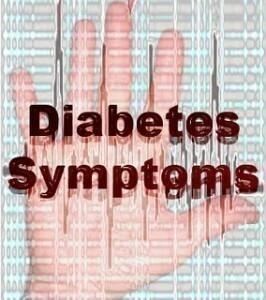 When poorly managed, even type-2 diabetes patients can also suffer from these difficult symptoms. There is a very strong tendency for type-1 diabetes patients to exhibit signs of diabetic ketoacidosis. When this happens, sufferers of this disease usually show signs like Kussmaul breathing, smell of acetone on the breath of patients and abdominal pain. Other signs include altered state of consciousness, vomiting and nausea. The most common minor symptoms of diabetes are unexplainable fatigue and vision changes. In order to treat and manage the signs and symptoms of diabetes, people need to undergo different kinds of diagnostic tests and procedures. Minor and major symptoms include weight loss, excessive thirst as well as excessive urination. When patients exhibit these signs, they are probably suffering from diabetes. Other diagnostic tests and exams needed for this type of chronic disease include detection of hyperglycemia and health screening. Many medical experts also use glucose tolerance test. Although there is no cure yet for this chronic condition, there are certain ways and procedures that people can use to alleviate patients from their pain and suffering. Some of the proven methods include oral intake of diabetic medications, regular exercise and proper diet. The use of insulin is highly recommended for people suffering from type-1 diabetes, but may also be used on type-2 patients whose bodies are non-responsive to oral drugs. In order to reduce pain and discomfort, diabetics usually wear diabetic shoes, consume appropriate diet as well as smoke less. Furthermore, patients are advised to exercise regularly. For type-1 patients, available medications for the disease include Apidra, Novolog or Humalog. There are also many kinds of insulin pumps available including the Accu-Chek, Insulet Omnipod and Medtronic Minimed.